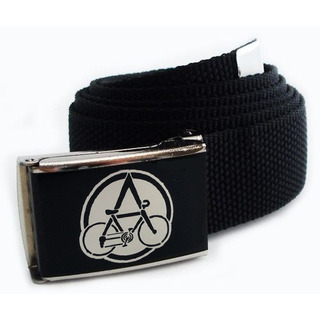 The "Bike Anarchy" Belt is made of 100 % polyester (black). On the metal buckle is a "Bike Anarchy" logo, on the other end it has a metal tip. The belt is easily adjustable, so you don't need a new belt when your weight changes ;) Just release the buckle, and move it and fix it again. This vegan belt is about 110 cm long and about 3 cm wide.